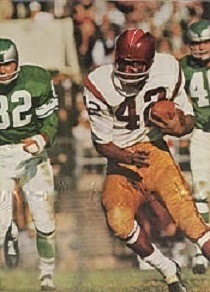 Taylor’s college career (and, potentially, life) nearly came to an end when he broke four vertebrae in his neck while making a tackle during Spring scrimmage in 1961, but following several months of recovery, he returned to star in the backfield for three years. Highly versatile, he played at running back, wide receiver, and defensive back and also returned kicks. Taylor led the team with four interceptions in 1962 and in ’63 rushed for 595 yards (averaging 6.8 yards-per-carry) and also gained 217 pass receiving and 308 kick return yards. He received All-Western Athletic Conference honors after both seasons. The Redskins, winning a coin flip to choose ahead of the Cowboys (who were also interested in the native Texan) chose Taylor in the first round of the 1964 NFL draft (third overall; he was also chosen by the Houston Oilers in the second round in the AFL) and he quickly moved into the lineup at halfback with his speed and ability as a pass receiver as well as runner from scrimmage. Redskins went 6-8 to finish tied for third with Philadelphia in the NFL Eastern Conference. Taylor had a lesser year in 1965, nagged by a foot injury and the lack of an effective fullback to pair up with him – he averaged only 2.8 yards in compiling 402 rushing yards but still caught 40 passes for 577 yards (14.4 avg.) and was again named to the Pro Bowl. During the ’66 season, new Head Coach Otto Graham shifted him to split end and, while initially reluctant toward making the switch, he led the NFL with 72 catches, for 1119 yards and 12 touchdowns. His size and skill made for favorable matchups, and he again topped the league with 70 catches in 1967, gaining 990 yards and scoring 9 TDs while receiving consensus first-team All-NFL as well as Pro Bowl honors. Taylor went on to consistently star at wide receiver with only one significant injury, a broken leg in the sixth game of the ’71 season, until he missed all of 1976 and came back at reduced form to catch 14 passes in ’77, his last year. He was a consensus first-team All-NFL selection once, received at least second-team recognition on five more occasions, all-conference honors yet four more times, and was chosen to the Pro Bowl after eight seasons. At the time of his retirement, his 649 catches ranked first all-time in NFL history, as did his seven seasons with 50 or more catches, and he gained 9110 yards (14.0 avg.) with 79 TDs. His rushing totaled 1488 yards and, adding in another 11 touchdowns, he scored 90 overall, which tied with Leroy Kelly for sixth place at the time. Taylor was inducted into the Pro Football Hall of Fame, Class of 1984.